Balinese drummer and composer I Made Lasmawan was born in the village of Bangah, in the Baturiti region of the regency of Tabanan, Bali in 1958. Strongly influenced by his family and involved in the arts since childhood, he entered KOKAR (Conservatory for Traditional Performing Arts) in Denpasar, Bali, and graduated in 1977. He continued his studies in 1978 at STSI (Indonesian College of the Arts) in Surakarta (Solo), Central Java, and studied traditional Javanese music, receiving his Traditional Indonesian Music degree in 1983. Pak Lasmawan has since traveled throughout the world, including Belgium, France, England, Singapore, Japan, and Mexico. He is a prolific composer who taught Balinese music at STSI from 1983 until 1990, when he was invited to San Diego State University to teach Javanese and Balinese music. 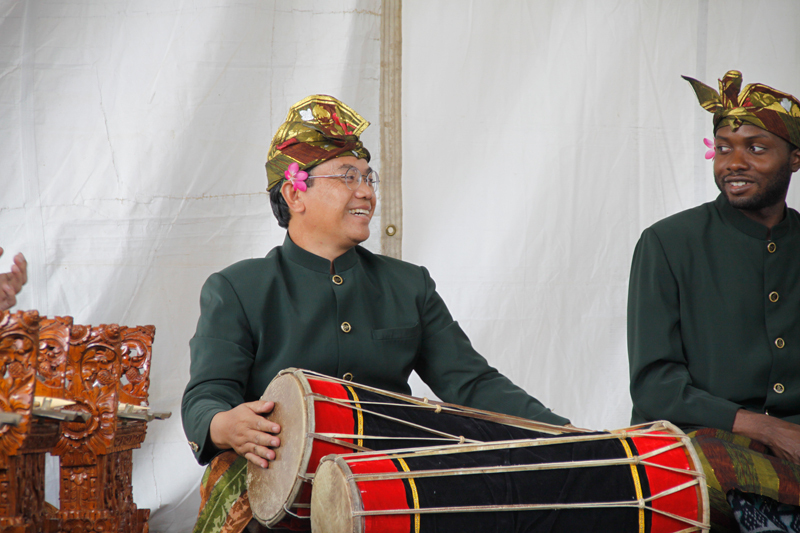 Living in Colorado since 1993 as Artist-in Residence with Gamelan Tunas Mekar, Pak Lasmawan is a Lecturer at Colorado College where he directs their gamelan ensembles and teaches courses on Balinese and Indonesian music and Hindu epics in music. He also directs gamelan ensembles at Metropolitan State University of Denver, the University of Colorado, Boulder, the University of Wyoming in Laramie, and throughout the Rocky Mountains. He regularly performs as a guest artist and director with university and college gamelans across the United States. Pak Lasmawan plays a leading role in both Bali and the US as the founder and director of Sanggar Manik Galih, developing community gamelan groups for Balinese, diasporic Indonesians, and Westerners. Pak Lasmawan is accompanied in the United States by his wife, Ni Ketut Marni, and his sons, I Putu Tangkas Adi Hiranmayena, I Made Tangkas Ade Wijaya, and I Nyoman Tangkas Aji Guyasa.